As promised, here’s another lovely goody from Miss Laura! So really take a good look at that page. Laura does a fabulous job at mixing patterns–in both design and texture. 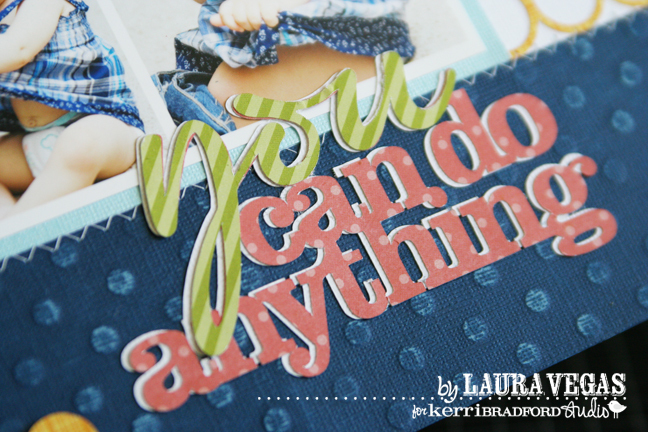 Notice how she mixed the solid dots and the open circles backgrounds from the Life Additions kit with embossed cardstock, patterned papers and borders. Great combination! 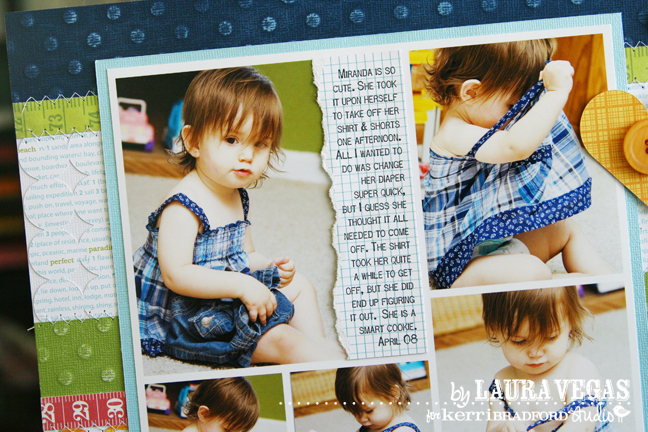 I also love how she added a ripped journaling piece over the large square of the photo template. I wanted to use one of Kerri’s storyboard templates for my photo collage, but didn’t have quite enough photos to fill up the spaces on the one I choose to use. I played around with the layers, deleting one of the openings, and making two of the openings a bit larger to fill that empty space in. For the upper left corner photo, I wasn’t happy with the crop on it, if I had used the entire large opening. So I adjusted the photo to how I liked it, leaving a bit of empty space in that opening. I then printed out my journaling on a piece of graph patterned paper, and adhered it over the empty space next to the photo. I also wanted to add a little interest to my pattern papers on the layout, so I used a few background shapes with circles (I’m slightly addicted to circles these days ;)). Since my collage was being adhered over the strips of pattern paper, I only needed to cut a small strip of paper to go on either side of the photo collage. The Life Additions: Background kit worked perfectly for this, with the small sized background pieces. This is a lovely layout. I have those backgrounds from Life Additions and haven’t used them yet. This has me itching to design something with them! Love this layout. Beautiful colors and design.